Nokia has announced a trio of global smartphones at Mobile World Congress in Barcelona. With the Nokia 6 leading the charge, and the Nokia 3 bringing up the rear, it's the Nokia 5 that sits in the middle. Priced at just €189, it's a fully-fledged Android smartphone with a full-metal body at bargain basement prices. Nokia's strategy here is clear: it's not to take down the flagship phones from Samsung or Google, it's to cut into the affordable end of the market with something that appears to offer great value. One of the family traits for Nokia's new Android handsets is that they all start life as a block of aluminium. They are machined from this block, rather than stamped, the aim being to ensure that they are durable and solid. This is the same sort of message we get from the likes of Apple or HTC and that feeling of solidity is apparent as soon as you get your hands on this phone. It's similar to the Nokia 6, but it's more rounded in the corners and around the sides, with a seamless meeting of the glass of the display and the metal of the body. Nokia said that it avoided using a plastic flange around the display that some manufacturers do, resulting in a tighter result. For us this design isn't as well executed as the Nokia 6 which feels like the better phone. It has a slightly curved back and sized at 5.2-inches, the Nokia 5 nestles down into your hand nicely. You'll notice the 3.5mm headphone socket, which is a great convenience feature for those who don't want to worry about sourcing a new set of headphones, but the older Micro-USB connection on the bottom might appear a little dated in 2017. 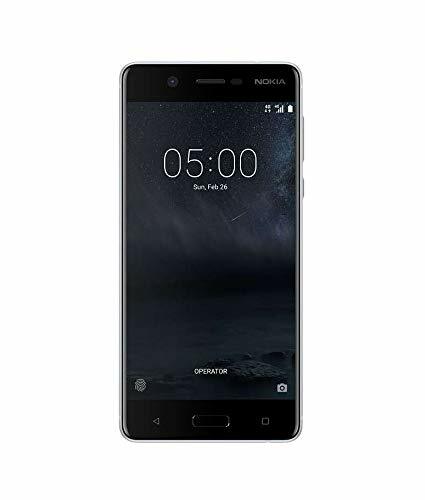 Available in a range of colours spanning blue, silver, black and copper, the Nokia 5 is well build, especially for the price being asked of it. The hardware readout for the Nokia 5 reveals its position and starts to fit the price point. The Qualcomm Snapdragon 430 chipset only gets 2GB RAM, but Nokia said this was because the 720p display didn't need the 3 or 4GB of RAM that's now more common. The Snapdragon 430 processor is fairly common on entry- and mid-range phones and while it won't compete with the likes of the Snapdragon 821 you'll find in some of the latest flagship devices, it will be fine for daily tasks like managing your email and keeping you connected on your social networks. Where you're likely to feel the shortcoming is on things like gaming and more intensive tasks, like video capture. The display is getting into the lower resolutions at 720p and at 5.2-inches, it's not as glorious as the full HD display of the Nokia 6; it's bright and colourful, but with the pixel density dropping to 282ppi, it's getting to the stage where it's noticeably losing sharpness. At this price, that might be acceptable, however, and in the time we've spend with the phone we've not had the chance to see how it performs in bright outdoor sunlight. We've also not had the chance to assess the performance of the battery. The 3000mAh sounds generous, however, giving the screen resolution and hardware that it's powering. There likelihood is that this phone will offer pretty good endurance as a result. Again, this is something we'll need to test, closer to the phone's launch in Q2. One of the other interesting details is that the Nokia 5 offers dual SIM, as well as microSD. Nokia 5 preview: Cameras ahoy! The rear camera steps down on the Nokia 5 from the 16-megapixels of the Nokia 6 to 13-megapixels. The number itself doesn't really matter - some of the best cameras on 2016's smartphones were rated at 12-megapixels - but what we don't see here is any hook into Nokia's camera heritage. There's no talk of PureView or Zeiss lenses, instead this is more of a basic offering. We've not had the chance to test the performance, but it seems to offer the standard range of features. Nokia has included its own camera app, which is the only change it makes to stock Android. The front facing camera on the Nokia 5 is the same as both the Nokia 6 and the Nokia 3, so it looks like fun-time wide-angle selfies are the order of the day. This is also and autofocus front facing camera, so you should be looking sharp when you shoot yourself. When it comes to the software there's good news: Nokia is not going to be tinkering with Android. There will be no bloatware, no icon changes and no added service, it's just pure Android Nougat. The devices we've picture here are pre-release software, but we spotted some interesting details, like Google Assistant and round icons, like the Google Pixel. Nokia told us the aim was to be as close to the Pixel's software experience as possible, using Google's services. That also extends to offering monthly security updates, as the assurance that new Android features would quickly be integrated. We've heard such promises before and they don't always ring true, but this is the cleanest Android version we've seen outside of a Nexus or Pixel device. Exactly how the software runs on this hardware we can't yet deduce, but apart from a tweaked camera app, this is pure Android all the way. On the hardware front things are starting to dip a little low however. The real judge of how well this balance has been managed will come down to how well this phone runs day to day. From the brief time we've spent with it that's difficult to judge. The Nokia 5 will be available for €189, with local pricing and availability still to be confirmed.